Our Spring Series of Girls Night, Guys Night and Youth Night starts the week of April 16th and we've got some fantastic activities planned. 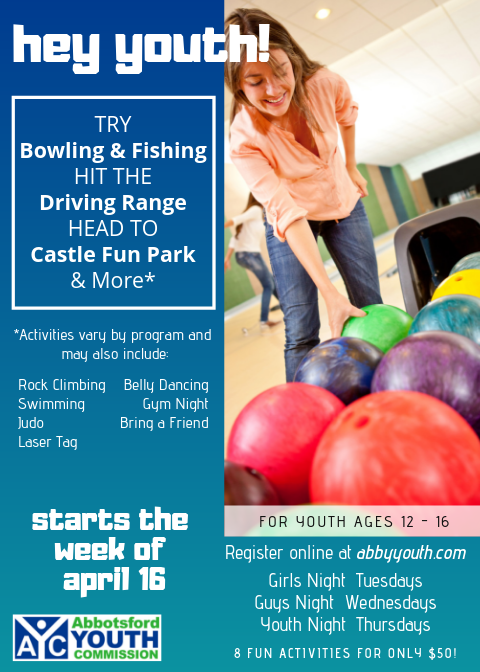 Youth can expect to try bowling, fishing, go to the driving range and playing mini golf at Castle Fun Park, plus much, much more! We've added a schedule overview for each series on our online shop and the calendars are also now available on our website to make it easier for you to find out what activities the youth will be participating in. Don't miss out on this great opportunity to get your youth active and trying activities around Abbotsford!